ZEN Fieldwork VIMS researchers Paul Richardson and Jon Lefcheck establish experimental plots in the Zostera Experimental Network’s (ZEN) Chesapeake Bay site. The experiment tests how natural gradients in marine biodiversity and physical forcing influence plant production and transfer through the food web. Photo courtesy of Emmett Duffy. Mesocosms VIMS graduate students Amanda Spivak and Beth Waterson measure ecosystem production in an estuarine biodiversity experiment. Photo courtesy of Emmett Duffy. 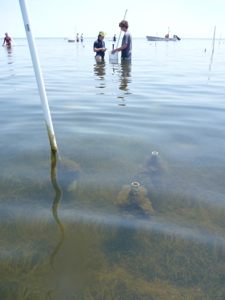 Ecosystem Production VIMS researchers measure ecosystem production in an estuarine biodiversity experiment. Photo courtesy of Emmett Duffy. 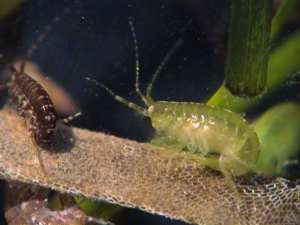 Estuarine biodiversity VIMS researchers measure ecosystem responses to herbivore diversity manipulation in an estuarine biodiversity experiment. Photo courtesy of Emmett Duffy. Loss of biodiversity appears to impact ecosystems as much as climate change, pollution, and other major forms of environmental stress, according to a new study from an international research team including Professor J. Emmett Duffy of the Virginia Institute of Marine Science. The study, published online in today’s issue of the journal Nature, is the first comprehensive effort to directly compare the impacts of wild-species loss to the anticipated effects of a host of other human-caused environmental changes. The results highlight the need for stronger local, national, and international efforts to protect biodiversity and the benefits it provides, according to the researchers from 9 institutions in the United States, Canada, and Sweden. A recent global study shows that 14% of the 72 known seagrass species are at an elevated risk of extinction, while 3 species qualify as endangered. Closer to home, the U.S. Fish and Wildlife Service currently lists 75 species as endangered or threatened in Virginia. Endangered or threatened species in Chesapeake Bay include the shortnose sturgeon, the Atlantic sturgeon, and all 5 species of sea turtles that frequent Bay waters. The American eel is under consideration for a threatened listing. Studies over the last two decades have demonstrated that more biologically diverse ecosystems are more productive. As a result, there has been growing concern that the very high rates of modern extinctions—due to habitat loss, overharvesting, and other human-caused environmental changes—could reduce nature’s ability to provide goods and services like food, clean water, and a stable climate. But until now, it’s been unclear how biodiversity losses stack up against other human-caused environmental changes that affect ecosystem health and productivity. “Some people have assumed that biodiversity effects are relatively minor compared to other environmental stressors,” says biologist David Hooper of Western Washington University, the lead author of the Nature paper. “Our new results show that future loss of species has the potential to reduce plant production just as much as global warming and pollution." In their study, the international team combined data from a large number of published studies to compare how various global environmental stressors affect two processes important in all ecosystems: plant growth and the decomposition of dead plants by bacteria and fungi. The new study involved the construction of a database drawn from 192 peer-reviewed publications about experiments that manipulated the number of species and examined the impact on ecosystem processes. The global synthesis found that in areas where local species loss this century falls within the lower range of projections (loss of 1 to 20 percent of plant species), there will likely be negligible impacts on ecosystem plant production, and effects of species loss will rank low relative to the impacts projected for other environmental changes. In ecosystems where extinctions fall within intermediate projections (21 to 40 percent of species), however, species loss is expected to reduce plant production by 5 to 10 percent, an effect that is comparable in magnitude to the expected impacts of climate warming and increased ultraviolet radiation due to ozone loss from the atmosphere. At higher levels of extinction (41 to 60 percent of species), the impacts of species loss ranked with those of many other major drivers of environmental change, such as ozone pollution, acid deposition on forests, and nutrient pollution. “Losing half the plant species in an area is like dousing it in acid rain”, says Duffy. The strength of the observed biodiversity effects suggests that policymakers searching for solutions to other pressing environmental problems should be aware of potential adverse effects on biodiversity, as well, the researchers say. Still to be determined is how diversity loss and other large-scale environmental changes will interact to alter ecosystems. “Although we’re emerging from economic recession, we’re falling deeper into a long-term biological depression. A major challenge looking forward is to predict how this biological impoverishment combines with other environmental challenges to impact natural ecosystems and society,” says Duffy. Authors of the Nature paper, in addition to Hooper, Cardinale, and Duffy, are E. Carol Adair of the University of Vermont and the National Center for Ecological Analysis and Synthesis, Jarrett E.K. Byrnes of the National Center for Ecological Analysis and Synthesis, Bruce A. Hungate of Northern Arizona University, Kristen L. Matulich of University of California Irvine, Andrew Gonzalez of McGill University, Lars Gamfeldt of the University of Gothenburg, and Mary I. O’Connor of the University of British Columbia and the National Center for Ecological Analysis and Synthesis. Funding for the study included grants from the National Science Foundation and the National Center for Ecological Analysis and Synthesis. “This analysis establishes that reduced biodiversity affects ecosystems at levels comparable to those of global warming or air pollution,” says Henry Gholz, program director in the National Science Foundation’s Division of Environmental Biology, which funded the research.